Yeah, those outdated open hours just don’t cut it anymore. But how do you set business hours in a small town? Setting business hours is a big mess. In our Survey of Rural Challenges, small business owners told us that trying to be open later hours with no success was their number one challenge, two years in a row. When Deb Brown and I did our Q&A session on The Future of Retail, several people asked more about business hours. 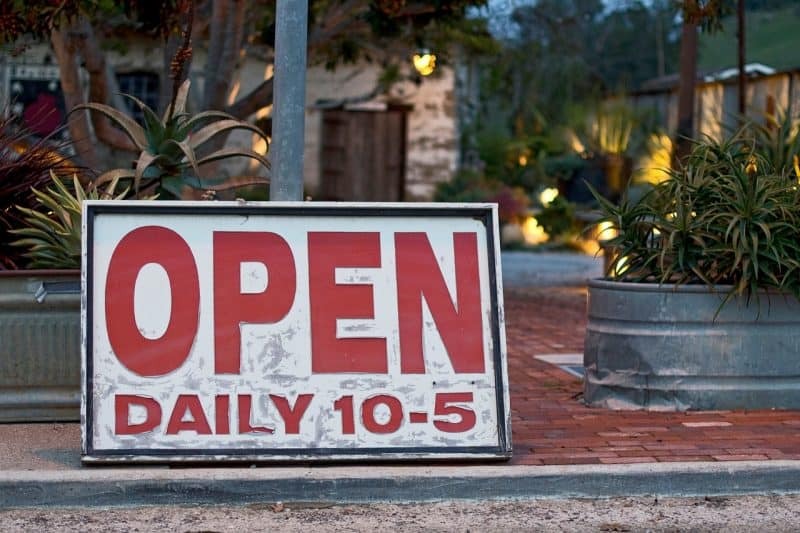 People ask which hours of the day they need to be open, whether they need to be open evenings, and which days are best to be closed in a retail business. People ask when specific types of businesses should be open, like yard and garden retailers. We all just want to know exactly when we should be open! You know, of course, that there is no one perfect answer. The best time for retail sales varies by the type of business, time of year, area of the country, and from one town to the town right next door. Variables like tourism, a local college or even the schedule of a major employer can factor into it. Once you get it all sorted out, then another business can start staying open late and suddenly the dynamic changes. The good news is we have some guidelines. This could very well be the most valuable insight into small retail, ever. Dr. Scott Dacko, Warwick Business School, coined the term Time-of-Day Marketing. His research looked at customers all across the day and evening shopping hours. What he found is that different types of people shop at different times of the day. You can use this insight to set hours by deciding which groups are less important to your business. Think you don’t need busy time-pressured people (that is, people with jobs and money)? Cut off evening hours. Or turn it around and decide which hours to be open to reach more different groups. Since small towns have a limited population, knowing how to reach additional groups may be the key to improving your chances for success. For more on how to put this research into action in your store throughout the day, read our article on drawing customers to your store for evening hours. Various retail experts have proposed different “best” times to be open. Roger Brooks consistently encourages businesses to be open later hours. He is widely quoted as saying that 70% of all retail sales happen after 6pm. He wrote an explanation of where he got that statistic here. I’ve run my store for 12 years now. We are open 10am to 9pm, Monday through Saturday. Sales from 5-9pm are always more than sales from 10am to 5pm. Almost every single day for over 3800 days, evenings beat day time for us. The only way to find out when most sales are made in your town is to run your own study. Now, before you run away screaming, it’s not as hard as you think. This is the easy way, in that no one has to go out and count customers. It’s the hard way in that it will require some cooperation, so you’ll have to build relationships with others. 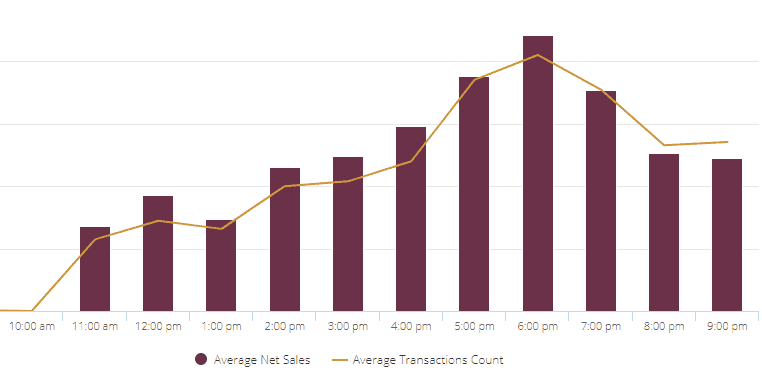 Ask local businesses of all kinds for their sales-by-hour charts. You don’t want to ask for their actual sales numbers. That’s way too personal. Ask only for the trends of when they sell the most. Their point of sale system or credit card processor may provide them with graphs or charts they can share. They can even black out any numbers on the chart. You just want to see the trends. Here’s a sample chart from my point of sale system. Notice how I cleverly cropped out the actual numbers and just left the trend. Here’s a chart of the sales by hour from my store. Look at all those sales after 5pm! Include all kinds of business when you’re collecting charts. Retailers, yes, but also restaurants, fitness centers, bars, the movie theater, coffee shops, and anyone else you can think of who has a business in town. You want to know when people are out and about in town, all day long. Look through the charts to see if you can spot patterns. Maybe people move from one part of town (downtown) to another (edge of town) throughout the day. Maybe businesses that cater to different age groups see their highest sales in the same part of the day. You can even try the convenience stores and chain businesses. You never know; their local staff might be able to share some data. I’d say this a good project for cooperating with your chamber of commerce or another organization. Business people my balk at giving you their charts, but they’ll be more likely to cooperate with a chamber study. Especially if the results will be shared back to all the businesses. Check with a community college, nearby university, or statewide university for business or math students in statistics classes to help you design, carry out or analyze the survey. Check with the local high school, too, to see if they study statistics. Stop by the county extension office, or call the statewide extension group. See if they offer free or low cost market research and could take on the project. They may have access to existing research that helps. I’m no academic, but I can imagine some ways to find out more about who sells what when in your town. Go downtown at dawn (or earlier if necessary) and count people on the sidewalk. Count every 15 minutes until your regular opening time. Do this 5 different days to see what you learn about early risers in your town. Go downtown at 5pm and count people on the sidewalk. Count every 15 minutes until sundown, 9pm, or when the last business downtown closes, whichever is later. Try this 5 different days to see what you learn about late shoppers. Now go to the boxes and chains at the edge of town. Count the number of people who walk into the store in a 15 minute period at 5pm and at each hour until 10pm. Asking people for their sales charts is starting to sound easier, isn’t it? Opening hours should be relative to the business you do. For example, a coffee and bagel shop will meet the needs of its customers if it opens as early as possible. Patronage will be higher because of customers on their way to work and early risers who need the coffee and bagel. In contrast this does not apply to a beauty salon. Most people stopping at the salon can come in at anytime after 9AM. The Salon might however stay open later than the bagel shop because people might stop at the salon after closing hours from work. Days of operations are also affected based on the nature of business. Tattoo parlor can open till late on a Sunday night and even open on holidays since most people take their time to patronize the business.